The Interurban Coach is a regional intercity route providing connections between Austin, Bastrop, Bertram, Burnet,Georgetown, Liberty Hill, Lockhart, Luling, Marble Falls, Round Rock, San Marcos, Taylor, Texas State University, LaGrange, Giddings, Paige, Smithville and Elgin and makes connections to Greyhound, Capital Metro and Amtrak. This flexible service provides rides locally and to nearby destinations, but requires a ride reservation be made in advance. Ideal for seniors, disabled individuals or others requiring special assistance, this community transit service provides Curb-to-Curb transportation throughout the CARTS district, and connects to the regional intercity bus network for extending access beyond local destinations. The Elgin Metro Connector provides bus service from Downtown Elgin into downtown Austin. The route provides service for persons wishing to travel for the weekday commute to Austin for work, shopping or other purposes. Please see below for schedule times, park & ride locations, fare and other information. The downtown Elgin stop has moved to Depot St. between Avenue B and Avenue C). 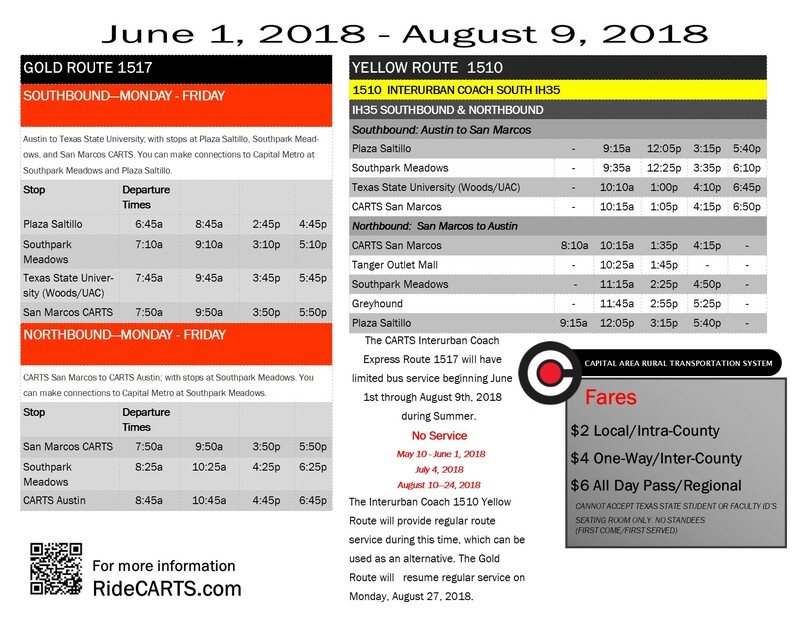 CARTS Municipal Bus is fixed route service offering regular routes daily in San Marcos and Georgetown and fix/flex route service in Bastrop that connect neighborhoods and downtown businesses for citizens and visitors. All fixed route and fix/flex route services offer wheelchair accessible vehicles. At our San Marcos CARTS station, we operate a full-service Greyhound station along with AMTRAK services. At our Round Rock station, we connect with Arrow Trailways and Greyhound intercity bus services. These stations give our customers access to transportation and freight. © 2015. All rights reserved. CARTS. Web site designed by A3.